Lee Taekyeom holding text that was created by his typography machine. Lee Taekyeom, assistant professor of graphic design at Appalachian State University, is writing his own history with the aid of machinery. Taekyeom has built his own 3-D printer with a clay extruder. With this machine, Taekyeom is able to create ceramic typographic sculptures. Typography is the visual art of creating written words. “At the time I had to do ceramic pieces by hand. I had to do everything by hand, piece by piece,” Taekyeom said. Lee Taekyeom’s 3D printer that he made himself. He uses it to create various ceramic object with a clay extruder. After Taekyeom graduated from the University of Illinois, he lost access to the ceramics studio he had been using. He could not use any casting tables, mold makers or other equipment. 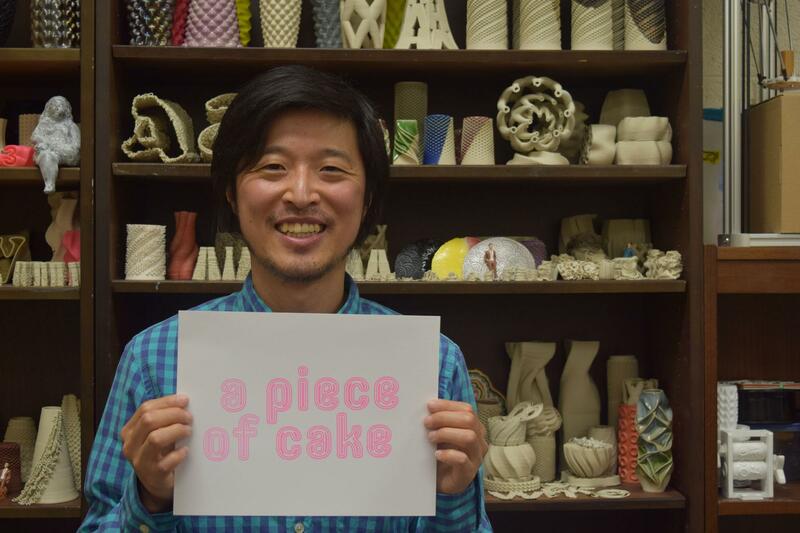 Other people were printing clay without using a casting table, mold or other equipment, so Taekyeom decided to combine 3-D printing, typography and ceramics. That way, he did not need equipment or access to the clay studio at his school. Taekyeom has two different types of machines. One machine was built from a do-it-yourself kit, and the rest he built from scratch. His ceramic 3-D printer was based on a delta style 3-D printer. 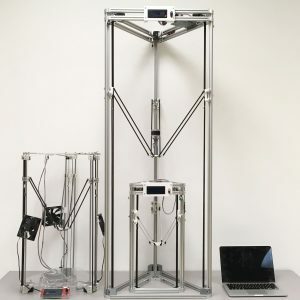 Taekyeom bought a DIY 3-D printer kit and tested it with the open source 3-D printers to figure out what he could do with the new technology. “After working with 3-D printers, I figured out that I could also write something with the machine,” Taekyeom said. According to Taekyeom, 3-D printing has been out in the world for quite a long time. Because there was no ceramic 3-D printer available to him, he had to build his own. He created his own tools for something he could not create with his own hands. Originally, a lack of knowledge in engineering slowed down Taekyeom’s projects. Luckily, ever since Taekyeom was young, he liked to take machines apart and rebuild them, curious of how they were organized and assembled. Taekyeom is willing to deal with endless troubleshooting. He said he loves to learn from every success and failure. According to Taekyeom, everything is a trial and error process. 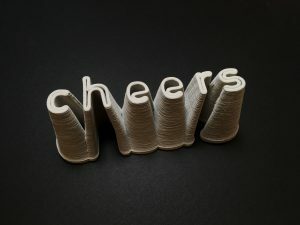 The word “cheers” made by Lee Taekyeom and his own 3D printer with a clay extruder. He built the 3D printer himself as well. Taekyeom’s 3-D typographic creations are different from the 2-D conventions graphic designers usually use. 3-D type is an artistic expression that contains characteristics that do not sit on a page. Instead, 3-D type letters have volume, texture and structure. Taekyeom prefers to sketch his designs first to give a surface shape and to visualize his idea. Many of his pieces contain unique textures. As for Taekyeom’s students, he wants them to learn how to teach themselves and learn about the design process more than other things. 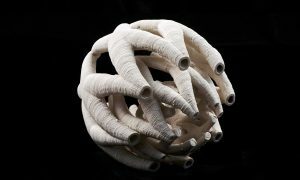 Lee Taekyeom’s favorite ceramic he has made using his own 3D printer with a clay extruder. He built the 3D printer himself as well. Monique Rivera, a senior studio art major with a focus in photography, took Taekyeom’s class, Introduction to Graphic Design. Cassidy Zemmin, a sophomore graphic design major at Appalachian State, also took Taekyeom’s Introduction to Graphic Design class. “He is a brilliant professor. Taekyeom has a deep understanding of design that really shows through in his 3-D printing work. He also has high standards of design that forces his students to challenge themselves in their work,” Zemmin said. Taekyeom wants his students to learn the core idea that you can use different tools to get to the same finish, which can be applied to different concepts. As for what is next for Taekyeom, he wants to build a bigger printer and a larger clay extruder to print human-scale 3-D typographic sculptures with clay and/or concrete.